Bognor on Boxing Day. Feels as traditional as bacon-wrapped chipolatas and bad cracker jokes the day before. However this is a trick played by the mind and the modern tendency towards an affected nostalgia. 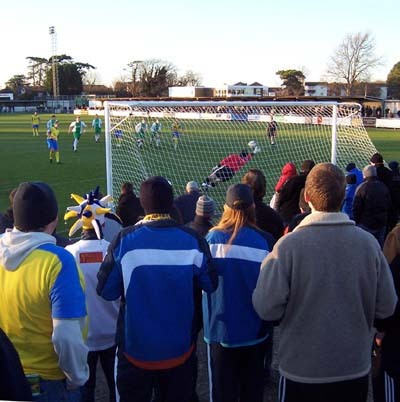 It is only since the advent of the South and North sub-divisions back in 2004 that we have come together in the same league and fallen in line with Conference policy of playing our nearest club home and away on Boxing and New Year’s Days. Our Yuletide opposition has remained consistently Bognorish ever since. This season may well be the last for a while that we get to celebrate our modern tradition as Bognor are having about as nightmarish a season as you can get. Forced to offload the majority of last year’s squad due to severe money issues, their clubhouse was then victim of an arson attack depriving them of their major source of revenue. Having now been demolished, the gap where it once stood is a disheartening sight for those who, at one time or another, have gotten triumphantly pissed in it. Mentioning no names. Ahem. As a result Bognor manager Mick Jenkins, once of our parish, has been juggling players like flambéd snooker balls, the saloon doors at Nyewood Lane slapping back and forth every week with bodies being thrown both in and out. Given the circumstances and the lack of ready cash, for the fact he’s got them to Christmas with the plates still spinning, ol’ leather-faced Mick deserves a great deal of credit. Indeed, they have battled through these tribulations without being on the end of any stern hammerings either. At least, until now. After all, as much as we would like to see our friends from down the road stay up and to continue our festive jaunts, we are hardly in a position to be charitable. If we wanted to give them something, we could always have responded, as several did, of contributing to their Christmas fund-raising request that people attending today’s game put unscratched lottery cards in a collection bucket in the hope that magic really can happen. On the field though, we couldn’t be gifting anyone anything, especially being nine points away from even a 12th place berth. Whether it was that statistic or the impending turn of the year that has focused the players minds of late it is difficult to say, but the last couple of weeks has, finally, seen an upturn in our fortunes. 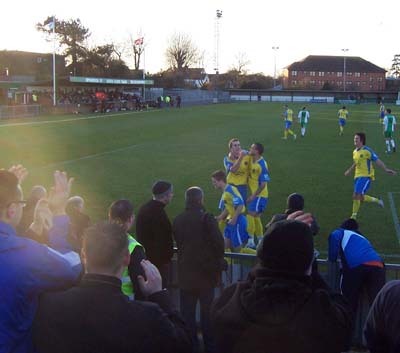 Firstly we deposited serial scalpers Bury Town, of the Southern League Midlands Division, in the FA Trophy courtesy of a Craig Watkins hat trick. The following Saturday, St Albans City were beaten 2-0 at West Leigh Park, a win that certainly did much to re-ignite a little confidence as, I’ll be honest with you, after our lifeless home defeat to Dorchester Town on December 6th, my belief in the current management had been crushed like a grape under the angriest of Stu Francis’ hooves. Prior to that I’d been trying to suppress the doubts and the negative thoughts like they were partially contained in a massively overpacked suitcase. However, the combination of the Eastleigh and Dorchester defeats with the knowledge that we had gone three months without a league win meant I could hold down the locks on that case no longer, the polo shirts of misery and the underpants of despair bursting out all over the floor. A 5-1 Boxing Day warmer away from home means now that I have now invested in a much larger suitcase. Plenty of room for the grumpy junk in this trunk. This is not to say that this is the end to the matter, three wins on the bounce are, of course, wonderful but, in the context of the season, they have been an awful, and I mean awful, long time in coming. It is a dawn, but we’ll have to wait and see whether it’s a false one. After all, we’ve ‘turned a corner’ so many times now, it’s become like watching a dog chasing its tail round and round a washbasket whilst the theme music from ‘Catch the Pigeon’ plays increasingly rapidly and loudly on a loop. The end result doesn’t paint the whole picture of the game, particularly as it was a Kevin Scriven rush of blood that gifted Bognor’s Louis Castles the opportunity to open the scoring in only the third minute. Also, it would be fair to say that we weren’t totally comfortable until the third went in with twenty minutes to go. Still, it seems churlish to be too pessimistic and critical in the light of a 5-1 away win, as we have not oft known their like, I can tell you, so let us focus on the positives. 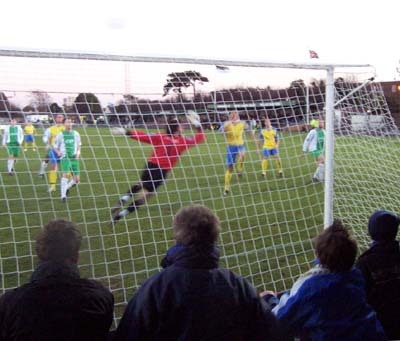 Chris Tardif, the Bognor goalkeeper - another who has known the love of the Hawkmob (“there’s only one f’in Tardif”) albeit only for a short loan spell from Portsmouth nine years ago – was in excellent form, yet we still put five goals past him. Had it not been for his saves and the stoic intervention of post and bar on a couple of occasions, the score would have flattered us even more. They say imitation is the greatest form of flattery, but I’d take a distended scoreline over someone mimicking my shtick any day of the week. As the game went on, and particularly after our third spirit-killing goal went in courtesy the high-chaired bonce of Big Robbie Matthews, we looked most unlike our recent selves, confident in the touch, and also in the shot. At one point Brett Poate tried an audacious lob from forty yards that necessitated Tardif (like TARDIS, this is clearly an acronym or mnemonic, possibly for ‘Team Anticipates Regular Defeats in Football’) to scamper like a cat being chased out of a neighbour’s kitchen with a rolling pin to reach and tip over for a corner. We could see a swagger starting to reveal from the pins-and-needles numbness, like Elvis after a hip replacement, gingerly but increasingly proficiently, practicising his swoon-triggering swing. Further good stuff came from Craig Watkins, notably his wily bit of business on the edge of the box, fox-trotting through a number of defenders before laying the ball off to Charlie Henry, who swept it home with power and telling composure. In other good news, Jamie Collins scored our equaliser from the penalty spot despite originally being pencilled in for minor heart surgery that would have otherwise kept him away today. God bless the NHS for its delays and late postponements. It must have also been good for our skipper’s confidence given he had placed a spot-kick against the post in the prior game against Stalebuns. Also, after several years toiling in the desert, maligned striker Luke Nightingale finally wrestled the evil chimp from off his shoulders by taking the fifth with a neat little poacher’s finish. He only scores in 5-1 wins it appears, his last having come during our rout of Basingstoke by that scoreline back in August. The other goal, the fourth, was scored by Ian Simpemba, but as both our central defenders have been amongst our most prolific net-botherers this season we won’t hype this one unnecessarily other than to say it was typically robust stuff coming from the big man’s forehead. Thus a spring is back in our step, and the pea-souper that had enveloped our outlook has started to disperse, hopefully on retreat without the wherewithal to regroup. Just the right set of the results at the right time, a big 5-1 win over Bognor setting us up nicely for our next game. 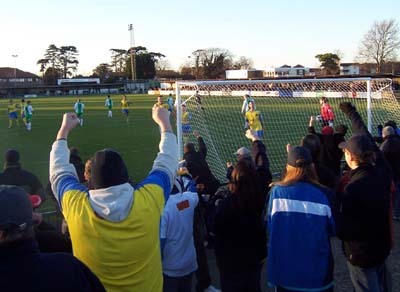 At home to Bognor. On New Years Day, as discussed.